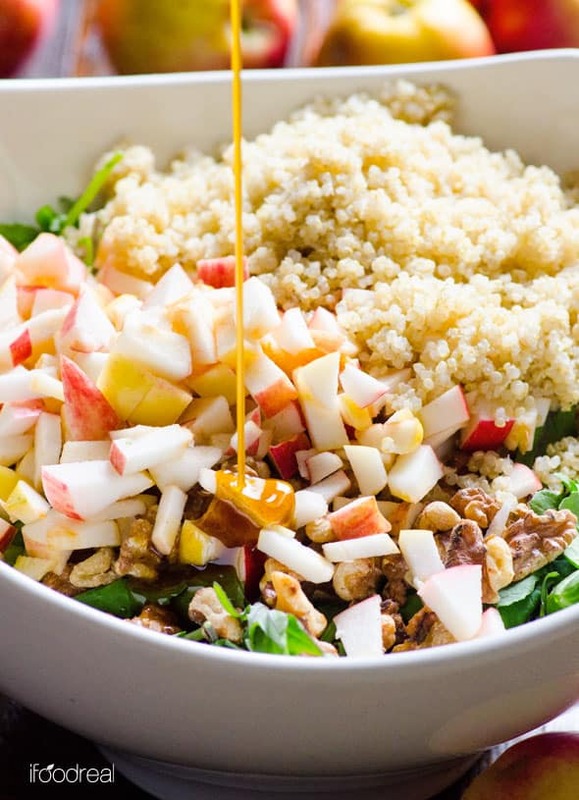 This is such a mouth, throat (literally, you just wait until it goes down) and heart warming kale and quinoa salad with sweet and zesty cinnamon dressing. 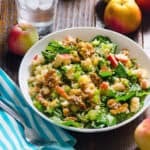 Toasted walnuts, crispy apples, nutty quinoa and super powerful kale come together in this plant-based one meal salad. I won’t suggest it as a sore throat remedy but rather a 20 minute clean eating dinner recipe, heck yeah! I’m trying really hard to maintain more plant-based diet and this salad is a quick way of doing so. And please don’t think that my kids were all over it. And I couldn’t be more proud to say that apples come from our 6 feet tall tree, that we didn’t plant and I haven’t touched, growing in our 100 square feet backyard. Half of the apples went straight for the applesauce because of the worms, and then to a freezer. I have no idea what kind of apples these are but they are sweet, delicious and organic! And the applesauce works wonderful for baking in winter like these 5 star review healthy chocolate muffins and healthy blueberry muffins. And the other half I have been tossing around all possible cold places in our house – from the fridge, to the crawl space and now to the garage. From childhood, I remember cold dark storage space on a side of our 100 year old brick house that we shared with other 9 families. It was full of apples, cabbage, various root veggies and canned jams, pickles and meat. We would make a trip down there on a winter night to stock up. I definitely miss some parts of real life growing up in Ukraine… The other night my son saw on TV kids riding in the back of a pick up truck and his jaw dropped…Yeah, son, safety first! I recently have discovered Bragg’s Raw Apple Cider Vinegar and let me tell you it doesn’t come close to any other big or generic store brands. So much flavour and so fresh. It’s like comparing carton apple juice to apple cider. As for kale, I used baby kale that I love getting in a huge bag from Costco. It’s pre-washed, can’t beat that! It is softer in texture and milder in taste than its parent. Both would work great in this salad. I find if you finely chop the fully grown kale, there is no need to massage it and it will have nice chewy texture. In my opinion, all nuts taste better toasted. I have heard they lose a bit of their nutritional values but I don’t care. I eat enough raw nuts for snacks and almond + peanut butter to worry about 7 roasted walnuts in my salad. It’s nuts, not bacon bits. And please don’t peel the apples – so many vitamins and minerals are in that peel! I even eat the core if it’s an organic apple, google it. And please don’t tell me it’s fatty. It’s not bacon, it’s healthy fats that fill you up and make you alive. 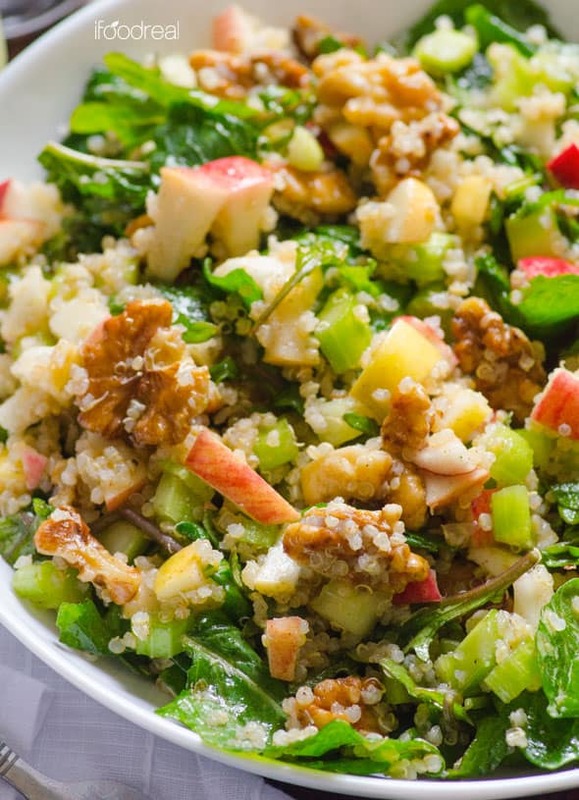 Know your limits, listen to your body and enjoy this kale and quinoa salad! Looking for more kale and quinoa salads, try my chicken kale quinoa salad and kale blueberry salad. 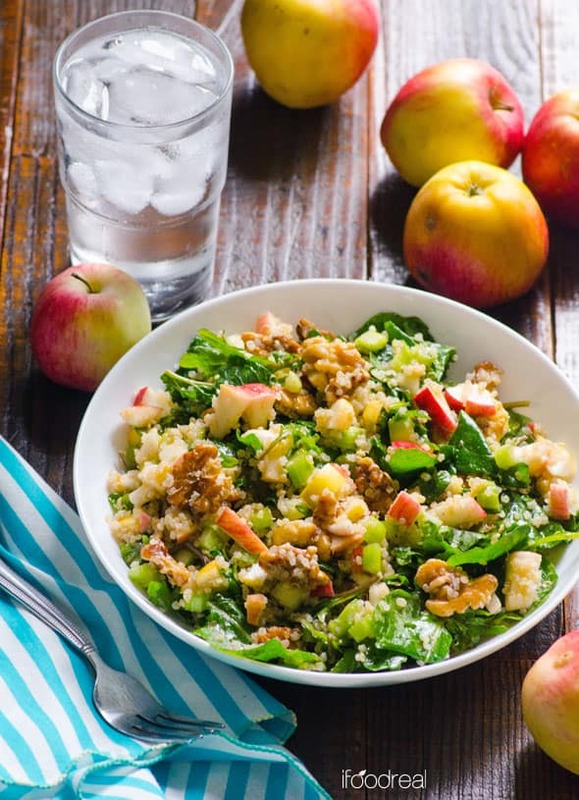 Cinnamon Apple, Walnut, Kale and Quinoa Salad – Heart warming one meal vegan salad recipe. Delicious fall in a bowl. Cook dry quinoa as per package instructions. If using leftover quinoa measure 2 cups. 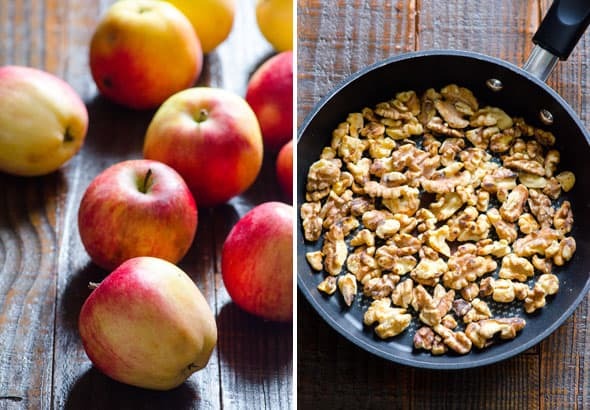 Add to a large mixing bowl along with kale, walnuts, apples and celery. In a small skillet, toast walnuts on low-medium heat until lightly brown, about 5 minutes. Stir frequently and watch closely not to burn. Transfer to a bowl with other ingredients. In a small bowl, whisk together Cinnamon Dressing ingredients, pour over salad and stir gently. Serve cold or warm, on its own or with chicken or turkey. Store: Refrigerate salad without the dressing for up to 2 days. Dressing keeps well refrigerated for a few weeks. All dressed salad stays fresh in the fridge for up to 1 day.